May 25, 2009, Copenhagen - The International Air Transport Association (IATA) reiterated aviation’s commitment to responsibly addressing the challenges of climate change and called on governments to deliver a global and sectoral approach to reducing aviation emissions in Kyoto 2. “Air transport is a global industry with a good track record and ambitious targets for environmental performance. But to achieve them, we need governments to take a global approach,” said Giovanni Bisignani, IATA’s Director General and CEO in a statement to the World Business Summit on Climate Change in Copenhagen. Bisignani called on governments to define a sectoral approach in Kyoto 2 with global accounting for aviation’s emissions through the International Civil Aviation Organization (ICAO) and open access for airlines to properly regulated carbon markets. Such an approach would maintain a level playing field for all airlines and replace overlapping national and regional schemes. A global approach is already underpinned with three ambitious industry targets: (1) a 25% improvement in fuel efficiency by 2020 compared to 2005, (2) to use 10% alternative fuels by 2017 and (3) a 50% absolute reduction in emissions by 2050. IATA is already working to set an important fourth target: a date for carbon-neutral growth beyond which our emissions will not grow even as demand increases. IATA gave a progress report on the aviation industry’s efforts to reduce emissions its report indicates aviation’s emissions will fall by 8% this year. Some 6% of this is from the recession and 2% is directly related to IATA’s four-pillar strategy. Pillar 1 - Technology: Fuel efficiency improved 70% over the past forty years, 23% in the last decade alone. This is mainly due to better aircraft and engines. Pillars 2 - Operations: “How we fly makes a difference. IATA’s Green Teams are working with airlines around the world to implement best practices. 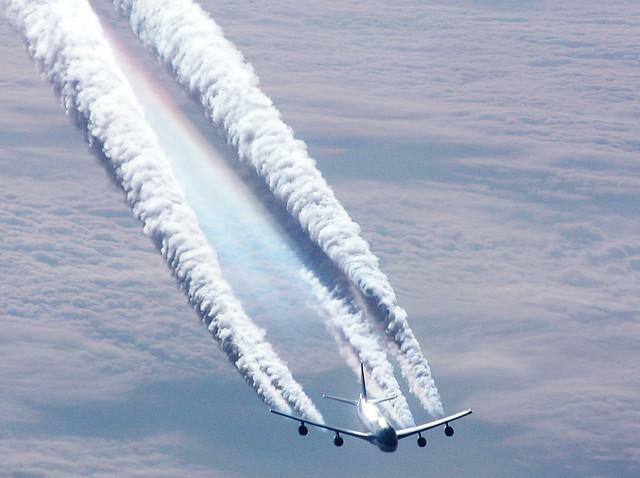 IATA reports indicate this work is now saving around 30 million tons of CO2 each year, . Pillar 3 - Infrastructure: IATA’s work to shorten routes is saving at least a further 30 million tons of CO2. Pillar 4 - Positive Economic Measures: Some 30 airlines have carbon offset programs. In June, IATA will launch an industry offset program so airlines can offer this option even more broadly. Biofuels: Bisignani made special note of the industry progress on biofuels. One of the most exciting recent developments is the progress being made in sustainable next generation biofuels. These have the potential to reduce carbon footprint by up to 80%. Three years ago nobody thought biofuels could be applied to aviation. Four successful test flights in the last year prove that biofuels work. For the first time aviation could have a sustainable alternative to fossil fuels. Airlines did this work without government involvement. But we could achieve much more, much faster, with a fiscal and legal framework to accelerate research and reward investment. Governments must get on board. Working with governments, a united industry - airlines, airports, manufacturer and air navigation service provider - made air transport the safest way to travel. By working together with a coordinated global approach the aviation industry can be the first global industry to achieve carbon-neutral growth and a model for others to follow. IATA (International Air Transport Association) represents some 230 airlines comprising 93% of scheduled international air traffic. The environment is one of LATA’s top priorities, along with safety and security. Airlines are working constantly to limit their climate change impact, emissions and noise. LATA vision for the industry is to achieve carbon neutral growth in the medium term and to build a plane that produces no emissions within 50 years. Although complete solutions are not available today, building blocks, such as alternative fuels, solar power and hydrogen fuel cells already exist. LATA is working with the whole industry, including manufacturers, airports, air navigation and others to turn this vision into reality. By reducing emissions through investing in technology, improving operational efficiency, building and using efficient infrastructure and positive economic instrument to provide incentives. Airlines have improved fuel efficiency and CO2 emissions almost 20% over the past 10 years. They will continue to improve, by investing in new aircraft and enhancing operations. Thanks to technology, today's aircraft are 50% quieter than 10 years ago. Local air quality around airports will benefit from new technologies, reducing nitrogen oxides 80% by 2020. Virtually all airlines with operations, to, from and within the European Union will come under the scope of the EU’s emissions trading scheme from 2012. Airlines are required to submit a monitoring plan by August 2009 and to monitor data from 2010. More information on emissions trading in Europe and what is required from airlines.